You can access open tabs of one computer across others If you work on multiple computers like at home and office. Suppose you were browsing something, have some useful tabs open in Google Chrome at the office. You can access the same Chrome’s open tabs at home as well. To access open tabs across synced computer and devices, you need to sign in to Chrome first. Let’s see how to sync open tabs and access on another computer. First sign in to Chrome if you want to save the open tabs and other stuff like Bookmarks, Forms data, Passwords, etc. You can choose each option what you want to sync. On the next screen enter the google email address and password to sign in. Once, you successfully log into your account. You will see Chrome Sync is turned on, click the OK, Got IT button. By default, everything will be synced across all your devices that sign in using the same email address. You can modify and select what you want to sync or not. Click the Sync option as shown below to view advanced options. On the Advanced sync settings page turn off the “Sync everything” slider. Now you can choose and turn off or On any options that you want to sync or not. You can turn On or Off Open Tabs, Apps, Autofill, Bookmarks, Extensions, History, Passwords, Settings, Themes & Wallpapers and more. At-least Open Tabs slider must be On otherwise, you will not be able to access open tabs on other devices. Run Chrome on another computer and Press Ctrl+H keyboard shortcut. You can navigate to this option manually, click the vertical dotted icon right-top corner, select History and then History again. On the History page, click “Tabs from other devices” option and then dotted icon. 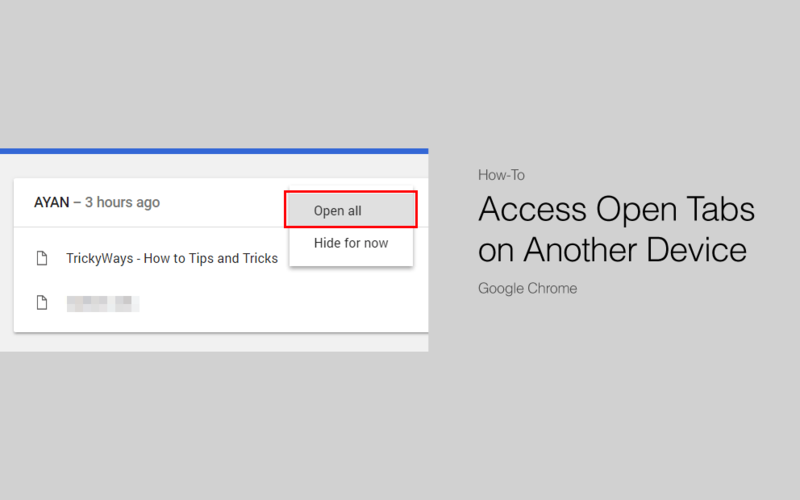 Once you click this menu button, select “Open all” option to access all the tabs that opened on other devices. If you running older Chrome version then follow these steps to sign in. Click on “Customize and Control…” Vertical dotted menu button top-right corner on Google Chrome. Select Settings and then click the button “Sign in to Chrome,” sign in using your Google account. Once you successfully logged in, click on Advanced sync settings button and choose what you want to sync. Now you are on another computer and want to access Chrome tabs that you have opened on another computer or device. First, sign in to Chrome using the same Google Account that you used on the other computer. When you logged in on Chrome, click the OK, got it button. I would suggest you close the Chrome browser and run again. Click on Chrome Settings menu and select Recent Tabs and here you will see the devices with the list of open tabs on it like “Ayan PC” is the name of another computer. Click the “More…” button to view the complete list of open tabs for each computer or device. This will open the History page of Chrome. As you can see below in the screenshot, the first section is “Ayan PC” with the list of open tabs on that computer. You can click each tab that you want to open on the current computer or just click the downward arrow and select Open all option to open all tabs of “Ayan PC” at once. Just use the same Google Account and sign in to Chrome on any computer Mac or PC, Android or iOS and get your Google Chrome open tabs, bookmarks, passwords, form data, etc. anywhere. I can believe I didn’t know about this until now! it worked perfectly! thank you so much! None of this works. Everyone in the world seems to be able to sync tabs between their devices but I they never show up on mine. When I go to look at tabs from other devices it just says there are none. go to the same area this article tells you to, but go under history instead. That should give you a list of other devices and their tabs. None of this works for how GC is now.